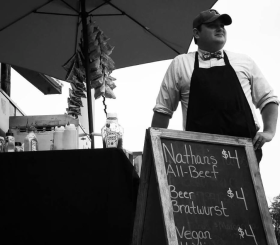 In the epic battle between purchasing a food truck or buying a hot dog cart there are a number of personal decisions that must be considered. In this post, we will outline the advantages and disadvantages of each option. By the end of this, you should have a much clearer perspective on whether a hot dog cart or food truck is right choice for you. Cost – From a business perspective, one of the attractive aspects of operating a hot dog stand is that the initial investment is so low. You could be slinging hot dogs seriously for just a couple of months and be able to completely pay off the investment at that time. There’s not a lot of real businesses that I can think of that fit into that category. As far as the initial investment, to get a pro grade vending cart you’ll need to invest between $3,000 – $7,000 depending on how many bells and whistles you would like to add into the cart. Of course you can go lower in the price category by sourcing a used cart on websites like eBay.com or Craigslist. But generally speaking, if you want something that is going to be able to pass a health inspection, you’ll want to invest a few grand into the cart. Reader beware if you decide to go bargain hunting for your business, you might end up with a cart that you are fixing frequently, can’t pass health codes, or looks like a place folks are scared to eat at. One Man or Woman Business – Most food trucks require at least two people to operate the vehicle due to the more complex menu that might be in place. This can mean adding an entirely new role to your plate: The position of HR manager. This means handling the hiring and firing of talent, payroll and taxes. A cart, on the other hand, is a one-man business due to the relative simplicity of assembling the dogs. The only reason you would need to hire another employee is if you decide to expand into a second hot dog cart. Smaller – There are advantages to being small. For example a hot dog vendor can often get into small parks and operate on sidewalks or right up alongside baseball diamonds. 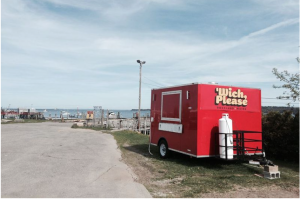 This is simply not an option for food trucks that are too large to vend in certain locations. Little Space and Less Menu Options – One of the big disadvantages of a cart is that you’re extremely limited to the number of products you can serve from the vehicle. With so little space, you will need to be selective about the types of condiments and meats you serve on the vehicle. 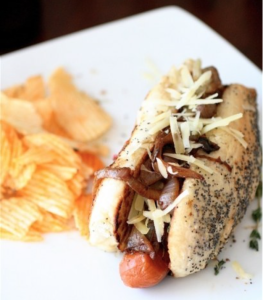 My advice is to find a style of hot dog that you excel at creating and stick with it. Idea’s could range from Mexican, Chicago style or even chili cheese dogs. Find something that tastes great, is a little bit unique, can be served quickly and things should work out well. In addition to working in a smaller space and not being able to store as many food items, you also will be limited on the equipment that you can install with a cart. Sure, I’ve seen hot dog vendors get creative by installing griddles to serve hamburgers from their cart, but many cities don’t allow this due to health laws. If you’re someone that likes to experiment with different ways to cook and serve food, the hot dog cart isn’t the best option. Menu – As food truck owners have already proven, you can execute just about any type of menu off of a truck with a bit of creativity. While food trucks have less space than a traditional restaurant kitchen, you should still be able to execute just about any menu item you want assuming you’ve got the right cooking equipment installed. In every city you’ll find trucks serving everything from burgers to Soul Food and sushi to sandwiches. Community and Buzz – Right now, there’s a little more community and buzz around food trucks than carts. For example, in most major cities there are regular food truck rally’s and events where five or more trucks will gather to serve food. So far… I’ve never heard of hot dog cart rally that is organized in a similar way. If you’re able to get involved in this tight little community, it can help send business your way. Mobility – On a food truck, you can hop into the cab, fire up the engine and drive off to the days catering or vending location. With a cart, you’ll need to find a truck to pull the cart. Expenses – You can pay less than $10,000 for a really nice hot dog cart with all the bells and whistles you could ever need. This is not the case with a food truck, however. Entry level for a reliable food truck is between $30,000 and $60,000. Of course some of the high-end, brand new trucks can be over $100,000. The main reason food trucks are so much more expensive is due to their engines and the more extensive mobile kitchen that is on board. Break Downs – Unlike carts, a food truck has an engine and will travel long distances. When you operate a mobile business, you will occasionally have break downs that you need to deal with. If a food cart breaks down, you can usually just rent another vehicle and you’re good to take your cart anywhere you need to be. It’s not always an option to tow a food truck.